Welcome to Winter! The air is getting much colder and holiday songs are all around. Trying to find something different, eco friendly, beautiful and well made? Look no further than Reinvented Elegance, mosaic, pressed flower art and wire wrapped jewelry by Joyce Wagner. I have had the pleasure of knowing Joyce for many years and she has been a constant inspiration of creativity and kindness. Her thoughtful nature shows through her artwork, with simple and yet intricate designs. As many things she makes are developed using natural materials, they are automatically one of kinds. You might have seen some of her work on the $20 and Under Gift Guide. Read on to find out about this talented artist and mother of 5! A~ I’ve loved to make things since I was little. In fact, grouting mosaics reminds me of making mud pies many years ago in my side yard. To the complete horror of a few girly girls in my neighborhood, I then proceeded to decorate them with Dogwood berries and sun-bake them on my aluminum slide. A~ Because I can’t stop myself! Seriously, because making stuff makes me happy, and I truly appreciate the opportunity of having my own business and the flexibility of working at home. Q~ What is a great (or greatest) success story? A~ So far, when something I create makes someone happy … and (better yet) when that person actually wants to buy it! Most of all, I want to make my family proud of me and to be a good role model for my kids. Q~ What is one of your greatest failures? A~ Not being able to add hours to my day! Q~ Where do you get your inspiration? A~ Literally everywhere. And I always joke that I get my best ideas in the shower. Q~ Why do you make/create what you do? A~ I love the opportunity to create with mosaics, pressed flowers, and wire jewelry; each is challenging and great fun and I never get bored. In making mosaics, I get tremendous satisfaction from finding discarded or thrift store materials and trying to breathe new life into them, and I love the idea that an odd assemblage of materials can somehow be greater than its individual parts (or we would hope so, anyway!). In creating with pressed flowers and leaves, I never cease to marvel at Nature’s beauty and what a wonderful gift it is to each of us. And in making jewelry, I love to throw odd materials and colors together with pressed flowers and twists of wire and see what happens! Q~ Where is your favorite place to sell? Or Favorite show? A~ Wow, it’s hard to pick just one. But I can definitely say that one of my favorite markets is right around the corner: The Del Ray Artisans Fine Art and Craft Holiday Market 2009. It’s a happy, friendly, artful, and cozy indoor show that opens on Friday night, December 4th, from 7 to 10 p.m. with a catered reception. This market continues on Saturday, December 5th, from 10 a.m. to 6 p.m. and Sunday, December 6th, from noon to 4 p.m. and also features a terrific bake sale benefiting a local charity, Food for Others. Admission is free. Q~ What is one thing you love about your business? A~ The many, many fantastic opportunities it provides: to work at home where my family is (thanks, Derrick! ); to love my job; to learn, grow in, and practice my art continuously; and the sheer pleasure of making new things every day. Q~ What is one thing you loathe? A~ The huge and sometimes opposing pulls, especially around holiday sale times, of trying to be a good wife/mother and a good artist/business owner. Also, the fits of nerves I have before markets … I confess I still get really bad stage fright. Q~ What is your dream about your art? A~ That someday I might have an agent (and perhaps a maid, too, but that’s another story – ha!). Q~ What is your mission? A~ To make things that will make people smile and bring them joy. A~ In beautiful Alexandria, VA, in the community of Rosemont. A~ Hmmmm, I’m happy where I am, but might have to do some more traveling (purely to research this, of course!) to provide a well-thought-out answer. A~ I want to keep working, learning, and thinking up new creations. Q~ What is your favorite question to ask people? DRA Fine Art & Craft Holiday Market, Alexandria, VA, 7pm to 10 pm. A variety of Joyce's goods can also be bought at A Show of Hands in Del Ray, 2301 Mount Vernon Avenue, Alexandria, VA, 22301 703-683-2905, www.ashowofhands.biz. 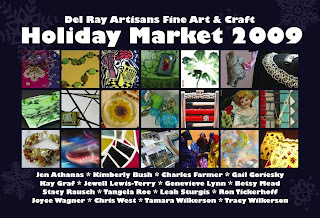 In addition to Joyce, there will be many other great artists at the Del Ray Artistans Holiday Market this weekend. Ceramics, glass, wood and all artistic media will be available for all on your list. Treat yourself to a goodie from the bake sale and pick up a wreath for the door. We have it all! I know a lot of people love to tear open their gifts and toss the paper around. And, you don't have to be two years old to do it. However, then, the paper is thrown out and creates a lot of waste. So, start out smart and create less waste in the first place! This year, I'll be offering re-usable fabric gift bags. Available in Christmas and non-holiday fabric and various sizes, they are great for little items like jewelry and gift cards. $3 each or 3 for $8, these are a wonderful add on for the tree hugger! I love your pressed flower art! Just beautiful. Isn't nature wonderful! There's a whole bunch of us 'nature lovers' on a guild I belong to...World Wide Pressed Flower Guild. We would love to have you join us.